We provide an online scheduling system engineered for your business needs. 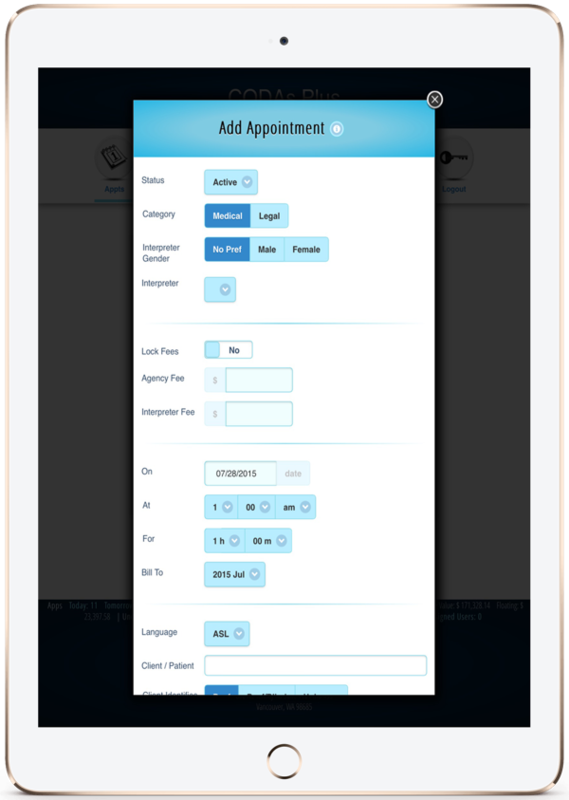 Allowing you and your customers to create appointments anywhere. The agency, interpreters, and requesters can all monitor appointments. Designed to be intuitive we provide a solution that works for desktops, tablets, and mobile devices. Our primary goal is to save agencies time. In order to accomplish this goal we provide scheduling solutions designed to pivot and scale as your agency grows. It's a complete acquisition-to-invoicing solution. The system allows companies needing interpreting services to register their staff to create and review scheduled appointments. Interpreters can mark their availability or claim appointments. 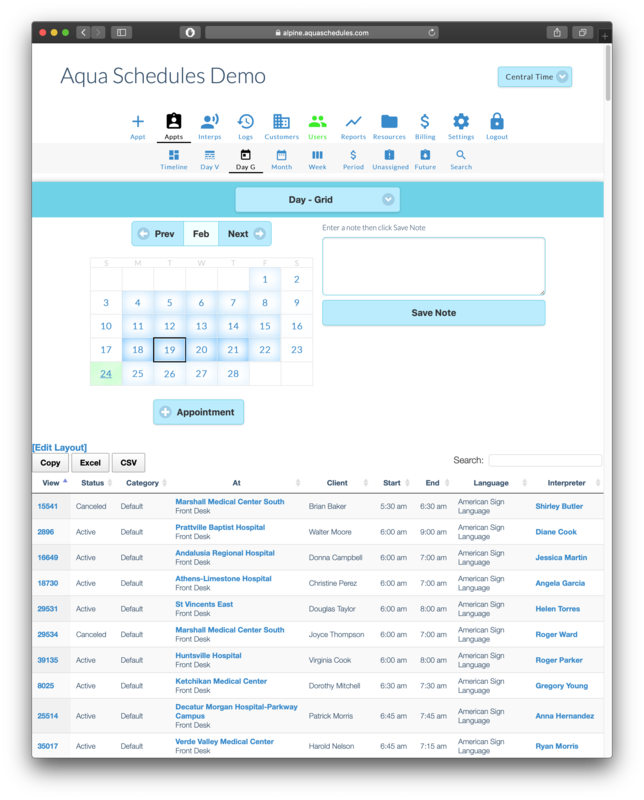 Aqua Schedules automatically calculates income and expenses. Invoices can be created within the scheduling system and synchronized to services like QuickBooks Online. * No charge for non-billable appointment cancelations! ** Your first 200 appointments each month are included in the minimum! Ask for our demo and request changes, we'll provide a quote for the enhancements. The agency can create and modify appointments, users, and customers. They can review interpreter availability, synchronize invoices with billing software like QuickBooks Online and view reports specific to the agency. Interpreters can claim unfilled appointments, set and maintain their availability, and view their schedule. Designed to work well on mobile phones interpreters can always get the information they need fast. Staff can request and monitor appointments. Groups of staff can share the same schedule. Reporting gives them monthly and overall statistics. Designed to work on mobile devices and even legacy browsers so your clients will always be able to connect. Interpreters can easily locate appointments at new locations with clicks to GPS websites. Schedule always available using any online enabled device. Have your customers go to your personal website instead of diverting them to another website you don't control. Win-Win pricing motivates us to help you get the most out of your system. Staff, interpreters, and requesters can all be alerted and notified by email or SMS. We provide the ultimate set of tools for storing information about your interpreters. Mobile design is a priority for us. Allowing your users to quickly access their important information on the fly is important. All roles (agency, interpreter and requester) have the same features available from their phone as they do from laptops or desktop. The agency is no longer locked to a work station. You can easily manage everything anywhere. Synchronize appointments to your mobile's calendar. Enter appointment billing information right after an appointment. Upload pictures of vouchers and attach them from your phone. Accept electronic signatures using your device. Your customers requesting appointments can create, edit, modify and view appointments from anywhere giving people like nurses a valuable tool as they move around their job site. We designed our scheduling system for agencies small to large, here are three different ways to give out appointments. Please note an agency can use all three methods at the same time to best meet their needs. This design is for small agencies who want the ability to divvy out appointments manually. The agency reviews all new appointments as they are entered into the scheduling system then manually assigns an interpreter to the appointment. As your agency grows you may want to begin offering appointments to interpreters. We provide two ways to do this, automatic or manual offer. Automatic offers are sent right after an appointment is created to interpreters that meet all qualifications. Manual offers are done by an agency representative, the offer button is clicked next to an interpreter and the system submits that interpreter an email. The scheduling system shows the agency the state of the offer, offers can be accepted or declined. The offer can also automatically assign the first interpreter who accepts an offer. Large agencies can choose to allow interpreters to claim appointments. The appointment is visible only to interpreters that meet all appointment qualifications. The interpreter can review information about the appointment. The agency can customize what information is shared with the interpreters prior to claiming the appointment. Once the interpreter claims the appointment it's automatically added to their schedule. 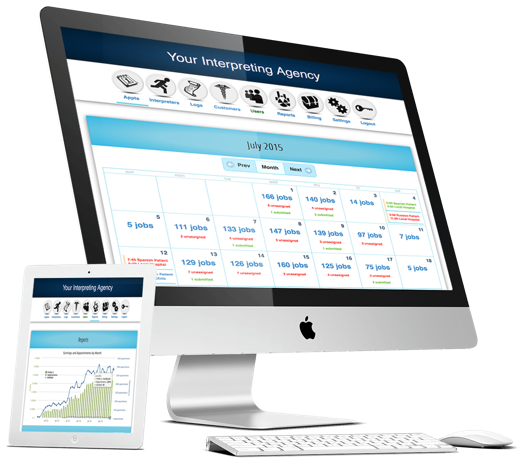 At any time you can talk to us about bringing in new features for your agency. We will finalize the details with you then provide a quote for the cost of the enhancement. Typically enhancements are shared with all the other interpreting agencies when we find it will benefit the majority. If you would like us to preform enhancements only for your agency or we find we would rather not release it to everyone then we can disconnect you from future updates and preform any enhancement.